How do you follow ?Moonlight?? That was the challenge posed to director Barry Jenkins, whose sophomore feature was the surprise winner at the 2015 Academy Awards. His bold answer: adapt a James Baldwin novel to the screen. Baldwin is one of the greatest black writers in American history, but his unique literary voice has always intimidated would-be adapters. Turns out all it took was a director of Jenkins?s skill and creativity to make ?If Beale Street Could Talk,? a gorgeous translation of Baldwin?s challenging aesthetic and a worthy follow-up to a Best Picture winner. The film is set in 1970s Harlem, where young lovers Tish (KiKi Layne) and Alonzo (Stephan James) try to build a life together. They were friends in childhood and practically raised as family, but they fall just as soon as they are capable of the feeling. Tish quickly becomes pregnant, and their future looks bright, until a racist police officer frames Alonzo for a violent crime against a woman, and he is sent to prison. From there on, Tish and her fierce mother Sharon (Regina King) work the system to win Alonzo?s freedom, while still preparing for the hard task of raising the child without him. 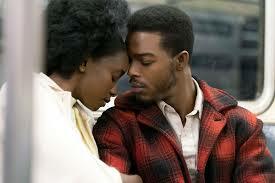 That?s the story told in a linear way, but ?Beale Street? is poetry not prose. Following Baldwin?s lead, Jenkins jumbles the timeline, alternating between scenes of Tish?s and Alonzo?s romantic ascent, when their happiness looks infinite and their struggles with him behind bars. All attempts to watch ?Beale Street? through conventional eyes get tossed out the window. Instead of neatly following the story, you are drawn to human moments lovingly sculpted by Jenkins?s observant eyes: Tish and Alonzo celebrating like kids in the streets when they find their first apartment together, or a heartbreaking scene in Puerto Rico when Sharon visits Alonzo?s accuser, hoping to convince her to recant her testimony. Then there?s the long shot of Alonzo and his old friend Daniel (Brian Tyree Henry), who has re-appeared in his life after years in jail. His camerawork slow like molasses, Jenkins lingers on the two old friends as they laugh over a few beers, and we see Daniel turn cold as he begins to discuss his incarceration. It foretells what is in store for Alonzo, and how structural racism does more than imprison the innocent and break up families. It hardens the soul and destroys all that is good. These lessons are beautifully brought to life by Jenkins?s cast of actors. Nearly every scene in ?Beale Street? scene brings a show-stopping performance by an actor who deserves a bigger stage. An early set piece in which Tish?s family spars with Alonzo?s after sharing news of the pregnancy is a masterclass in writing, acting, and staging. Watching them bounce off of each other, too consumed with passion for their children to care about the sting of their words, is like sitting in on a particularly contentious Thanksgiving dinner. It?s a scene so good that most movies would never recover from it. But Layen and James remain compulsively watchable throughout, anchoring the happier side of the story with lived-in innocence and deep affection. Jenkins knows just how to frame them, deepening the intimacy by often shooting them in close-up looking directly at the camera. It?s hard not to fall in love right along with them. Through this broken narrative and these heart-wrenching performances, Jenkins argues that the black experience in America is too painful to be told straightforwardly. Who would want to see a film that shows our innocent young lovers taste happiness and then have it ripped away with no hope for reclamation? Instead, ?Beale Street? formally demonstrates that happiness is ephemeral, and it should be both cherished and carefully guarded. So should this film.